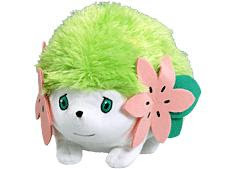 Tomy will release Shaymin plush on 30 May. Size is approx. 10". Subarudo will release 10 figures, Chupa Suprise Figure DP4 on 14 April. Canday toys, size is 0.9", a figure is inside one of 5 kinds Poke Balls (PokeBall,UltraBall,MasterBall,GreatBall, RepeatBall) . Previous items are also mentioned as follow. 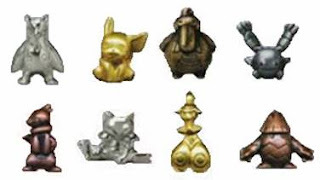 Kyoudo will release 8 figures, Pokemon metal figure collection DP4 in April. 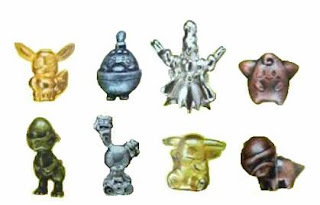 Size is 0.7", Gashapon (capsule toy). A figure has 5 color variation. (gold, dark gold, silver, gunmetal gray and copper) This series has been started since 1997. Thank you for visiting to All About Pokemon Figure (AAPF) always. This info for mobile users. If browsing AAPF by mobile terminal, would recommend the following two way. One of web service company river-stone services-in 'brogger mobile viewer'. If browsing AAPF by mobile terminal, please access/bookmark to AAPF url. Menu and contents are converted simply. Using by google mobile proxy. Images are selectable. Here is AAPF with images or without images. Tomy will release 4 Amigurumi Key Chains on 19 April. Will update the size later. Amigurumi is knitting or crocheting stuffed toy. Bandai will release 6 5 Action Key Chains (partial movable) DP2 in the end of June. Will post the photo and update on the movable part later. Previous items are also mentioned as below. Pokemon Center Japan have opened since 25 April 1998. These plushies are 10th anniversary special version, will release in the end of April. Size is 5.5", Pikachu (center in photo) is 11". 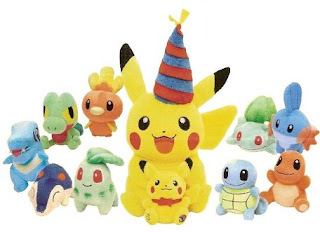 Heartland released Pokemon figures for Children's Day in the beginning of March. Size : 55" (length) x 45" (height) x 28" (depth). Size : 6.8" (length) x 5" (height), Weight: 575g. 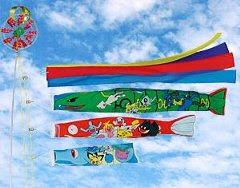 Another photo is Koinobori Pokemon version. In Japan, 5 May is Children's Day and is a festival for boys. 5 May is one of Japanese national holidays, is also traditionally called Tango no Sekku. Girls's day is 3 March, called Hina Maturi. On Children's Day, families celebrate the healthy growth and happiness of children. And families with boys fly huge carp-shaped streamers (Koinobori) outside the house and display dolls of famous warriors and other heroes inside. The carp was chosen because it symbolizes strength and success; according to a Chinese legend, a carp swam upstream to become a dragon. 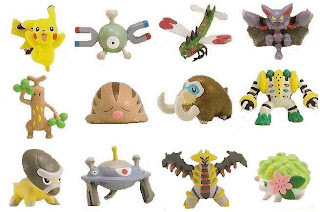 Updated inside page in this blog "Summary List of Pokemon DP figure/plush release status", linked to related pages. Hoping it will be more useful. Pokemon official Fan club in Japan offers the prize Empoleon plush. 100 winners by lottery, answer the quiz after watching 'Pokemon Ranger Batonnage Web Comic', 21 March through 30 June. Size is approx. 3.2ft if spread the wings. BTW, auction of Banpresto plush Azelf, Cresselia and Phione are starting in my eBay store. If interesting, please visit and check it. New Pokemon plush Regigigas will be introduced by Tomy on 15 May. Size is 13.5". 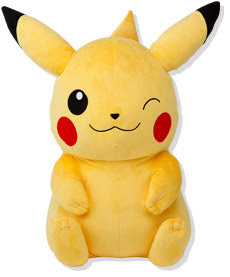 The followings new Pokemon plush will be introduced by Banpresto in May. Size is approx. 10" height, game prizes. 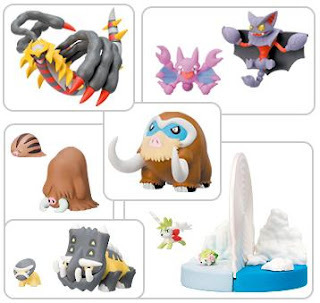 Tomy Monster Collection Series will release 2 figures of Pokemon DP on 30 May. Updated summary list of released figure, refer to Pokemon DP figure release summary. And photo for #486 Regigigas in May is uploaded. 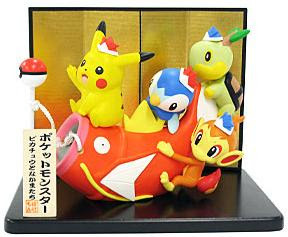 Ensky will release 13 figures of Pokemon Keshi-poke series DP4 in the beginning of June. Size is 0.7" , the figure comes in an eraser Pokeball. (Keshi means eraser in Japanese) DP3 was released in last December. 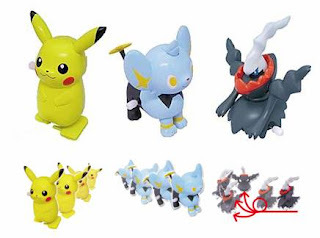 Photos for Pokemon Figure Release Info in May#1 DP series and Pokemon Figure Release Info in May#2 (Tomy MC) Battle Scene Series are uploaded. #486 Regigigas's photo is uploaded. Tomy will release 2 figures set (6figures/1set), Monster Collection Series Entry Set A and B on 17 April. Left photo is Set-A, right one is Set-B. New pose Pikachu and Piplup are included. Bandai Pokemon Kids DP7, a photos (21 April release) is uploaded. 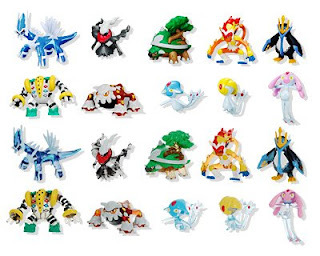 Mantyke is same as movie 2006 box, Happiny is same as 10th anniversary box, Infernape is same as movie 2007 box, Turtwig, Weavile, Manaphy and Palkia are new pose. Here is upcoming game and movie summary. 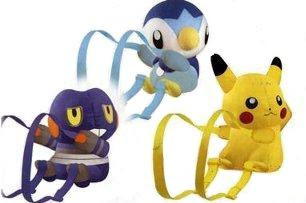 Banpresto will release Pokemon Knapsack, Pikachu, Piplup and Croagunk in May. Size is approx. 9.8", game prizes. 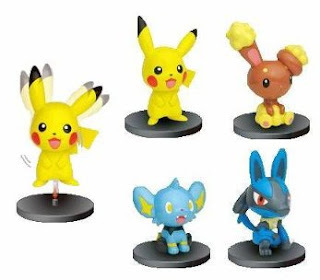 Subarudo will release swing-head (head can slowly move from side to side) figures Pikachu, Shinx, Buneary and Lucario in the end of March. Size is 2.3", it can detach a figure from stand. Photo for Yujin Pokedex DP07, will release on 25 March is uploaded. 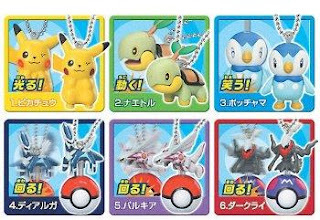 Bandai Pokemon Super Get Series 1 to 15 are full covered DP 105 Pokemons except for Shaymin and Arceus. As best selection series, SP01 will out in April and the following SP02 will out in end of May. Will post the photo later. Subarudo will release clockwork figures Pikachu, Shinx and Darkrai in the middle of March. They can walk by clockwork. Will update about size. Photo for Bandai Pokemon Super Get Series 15, figure release in March is uploaded. In April, best selection series SP01 will out. Baker company Daiichipan offers the prize, Pikachu jumbo plush, 1200 winners by lottery, to apply stickers (1set 6pcs) of "Pokemon Bread" by 30 April. Size : 0.4m (width) x 0.75m (height). "Pokemon Bread" is well‐known as Decochara sticker, started since 1998. Yujin will release Zukan (3D Pokedex) Series DP08, 10 figures/6sets in the end of June. middle of July. Will post the final photo later. Updated summary list of released figure, refer to Pokemon DP figure release summary. Pokemon official site in Japan offers the prize, includes notebook, Giratina face towel and one of plushies Giratina or Regigigas or Pikachu (random selection), 30 winners by lottery, fill out questionnaires in Janapese (about distributed magazine at Pokemon center) by 13 April.